Put the beans in an 8 to 10-quart heavy enameled casserole. Add the salt, leek, onion, carrot, tomatoes, garlic, tomato paste, bouquet garni, pancetta, stock and cold water and bring slowly to a boil, skimming off the froth. Reduce the heat, cover, and simmer for about 1 ½ hours. Pick the sausage with a fork, add to the beans, and cool for about 15 minutes longer. Preheat the oven to 375 degrees. Season the duck and pork with salt and pepper. Place them side by side in a roasting pan and roast for 1 ½ hour to 2 hours. When the beans are cooked (they should be tender but not mushy), turn off the heat. Lift the sausage, pancetta, onion, carrot, leek and bouquet garni form the casserole onto a baking sheet. Discard the onion, carrot, leek and bouquet garni. When the duck and pork are cooked, pour ¼ cup of the fat from the roasting pan into a measuring cup and set aside. Discard any remaining fat and deglaze the pan by adding ½ cup of the cooking liquid from the beans to the pan and bringing to a boil, stirring to melt all the solidified cooking juices. Add the liquid to the beans. Remove the casing from the sausage and cut the sausage into ¾ - inch-thick slices. Slice the pancetta into strips ½ inch wide by 3 inches long. Slice the pork roast lengthwise in half and then into 1-inch-thick slices and set aside in a dish. Transfer the beans to another container, then layer the various ingredients in the casserole, starting with about one third of the beans, followed by alternating layers each of the meats and more beans ending with beans. Moisten the bread crumbs with the reserved fat and spread them over the entire surface of the beans. Bake for about 20 minutes, until a crust forms on top. Break the crust and push it into the beans with a large spoon, then continue cooking for another 30 minutes. At the end of the cooking time the casserole can rest out of the oven for 20 minutes before serving. Winter is here and I could not be happier. Not because it is cold, that part I can live without it, but because I can make hearty meals. 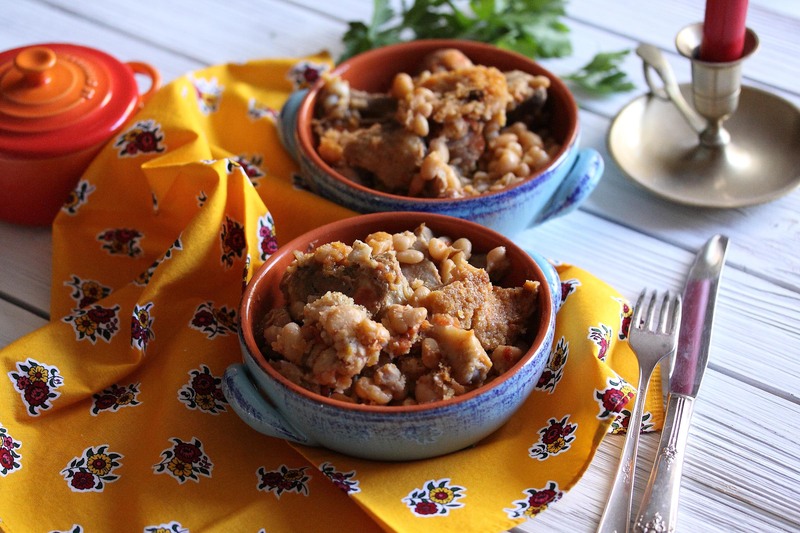 Duck cassoulet is just the perfect winter fare that I was looking forward to challenge myself to prepare for my family. 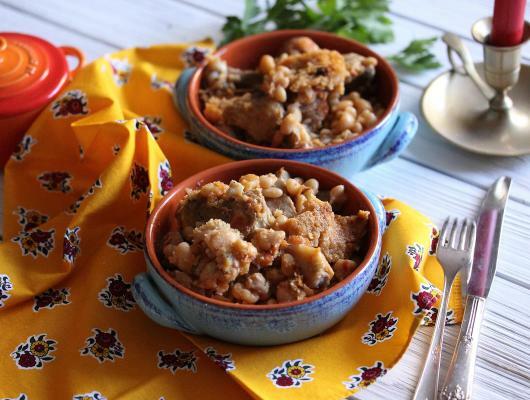 Cassoulet is the classic one-dish meal of the Southwest of France. The recipe that I made is from my favorite chef, Jacques Pepin from his cook book “Essential Pepin". Let me assure you, it is not difficult at all, however it will take you a few hours to prepare it. The result? A fantastic meal that will be gone in a jiffy. The recipe has two components: the beans and the meats. They are cooked separately and them assembled for a last cooking.